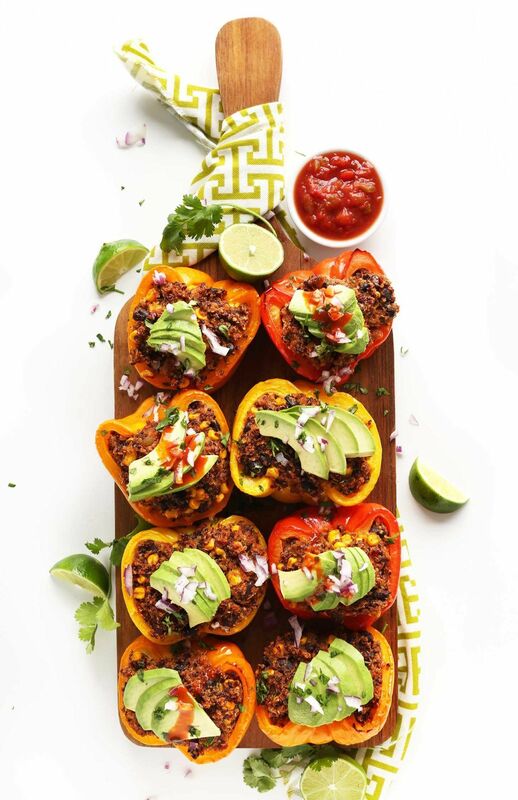 Amazing Spanish-style quinoa stuffed peppers made with just 10 ingredients! Simple, flavorful, full of protein and fiber and entirely vegan and gluten free! Add quinoa and vegetable stock to a saucepan and bring to a boil over high heat. Once boiling, reduce heat, cover, and simmer until all liquid is absorbed and quinoa is fluffy – about 20 minutes. Preheat oven to 375 degrees F and lightly grease a 9×13 baking dish or rimmed baking sheet. Brush halved peppers with a neutral, high heat oil, such as grape seed, avocado or refined coconut. Add cooked quinoa to a large mixing bowl and add remaining ingredients – salsa through corn. Mix to thoroughly combine then taste and adjust seasonings accordingly, adding salt, pepper, or more spices as desired. Generously stuff halved peppers with quinoa mixture until all peppers are full, then cover the dish with foil. Bake for 30 minutes covered, then remove foil, increase heat to 400 degrees F, and bake for another 15-20 minutes, or until peppers are soft and slightly golden brown. For softer peppers, bake 5-10 minutes more. Serve with desired toppings (listed above) or as is. Best when fresh, though leftovers keep covered in the refrigerator for 2-3 days. Reheat in a 350 degree oven until warmed through – about 20 minutes.